Patience, reassurance and consistency help children transition into a blended family. 3 Is It Common to Fight With a Husband After the Birth of a First Child? Marrying the person of your dreams and starting your new life together is typically an exciting and wonderful time; however, if you and your new spouse both have children from previous relationships, you need to keep in mind that creating a blended family is not without challenges. 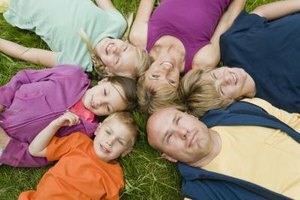 The transition to a blended family is often difficult for children -- and parents alike -- but you can take steps to make the adjustment process easier. Children need time to adjust to the changes of a blended family. They no longer have their parent to themselves -- and they also have a new adult and perhaps, step siblings in their lives. These changes may cause them to feel threatened, angry and/or jealous. Be patient and don’t try to force relationships. You should also reassure your biological children that your feelings for them haven't changed. Try to set aside one-on-one time with your biological and stepchildren. Realize that children will adjust to the new living arrangement in their own time. The children’s ages and personalities will factor into how quickly they adjust to the blended family. HelpGuide.org notes that children under the age of 10 more readily accept a new adult in their lives than children ages 10 to 14, who tend to have the hardest time adjusting. Teenagers age 15 and older generally spend more time away from home, forming their own identities outside the family, so they don't have as difficult a time adjusting as preteens. Also keep in mind that it might take two to four years for a new step family to adjust to living together, according the American Psychological Association. When it comes to discipline, the biological parent should discipline his children until the step parent establishes a solid relationship with her stepchildren. Stepparents should first focus on establishing a relationship that is more akin to a friend or camp counselor first than a disciplinarian, according to the American Psychological Association. As a stepparent, you need to establish a sense of trust and security with your spouse’s children. Both you and your spouse should come up with a set of house rules and consequences that apply to all children in the household. Sit down as a family and go over the expectations and rules, which you should base on the children’s ages. Creating family routines and rituals can help members of your blended family bond. Find activities or routines that everyone enjoys like a family game night, a big Sunday morning breakfast or movie nights. If possible, try to incorporate prior family traditions into your new blended household. This can help children feel that they still have their same identities within the blended family as they did prior to its creation. For example, if you celebrated your children's birthdays a certain way before you married your new spouse, continue celebrating them that way. If you haven’t already physically joined families, consider a home that is new to everyone. This might help prevent territorial issues. When it comes to communication, make a point of letting everyone freely express their feelings and keep the lines of communication open. Take note if a child is withdrawing and try to determining what is upsetting him. As far as showing affection toward your stepchildren, the American Psychological Association notes that both boys and girls in step families typically prefer verbal affection, such as praises or compliments, rather than physical closeness, such as hugs and kisses, from stepparents. However, this can vary depending on the child's personality as well as the child's age and gender. If you are unsure as to what is appropriate, you can ask your spouse how she feels -- and she might even ask her children what makes them feel most comfortable. Why Does My Husband Dislike His Stepchildren?